The cover for the fifth Archie Mega Man has surfaced online. Due in June 2013, This hand-dandy volume is set to chronicle issues 17 through 20. Unlike past volumes, #5 does not consist of a single story arc. Instead, your getting several stand-alone, original stories with little to no relation in between. 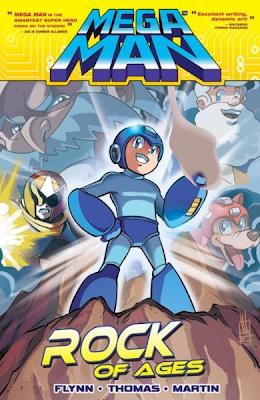 Full details available at Mega Man Monthly. Actually, issues #17 & #18 contain the two-part origin story for ProtoMan. So technically, this volume does contain a story arc, albeit a shorter one than usual.